In Northern California two successful CEOs are both indispensable to their growing companies’ futures. Both are brilliant at the power game. But the difference between them is huge. One is a man, the other a woman. In this riveting novel, Danielle Steel explores what that means as she takes listeners into the rarefied world of those at the pinnacle of international business and reveals the irrevocable choices they make, what drives them, and how others perceive them. The heady drug of power impacts everything they do. 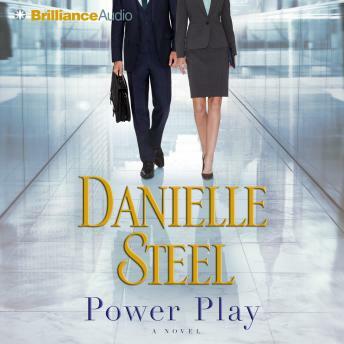 Power Play Even though Harvard-educated Fiona Carson has proven herself under fire as CEO of National Technology Advancement, a multibillion-dollar high-tech company based in Palo Alto, California, she still has to meet the challenges of her world every day. Devoted single mother, world-class strategist, and tough negotiator, Fiona weighs every move she makes, and reserves any personal time for her children. Isolation and constant pressure are givens for her as a woman in a man’s world. Miles away in Marin County, Marshall Weston basks in the fruits of his achievements. At his side is his wife, Liz, the perfect corporate spouse, who has gladly sacrificed her own law career to raise their three children and support Marshall at every step. Smooth, shrewd, and irreproachable, Marshall is a model chief executive, and the power he wields only enhances his charisma and is his drug of choice. And to maintain his position, he harbors secrets that could destroy his life at any moment. His world is one of high risks. Like many women in her position, Fiona has sacrificed her personal life for her career, while Marshall dances dangerously close to the edge and flirts with scandal every day. Both must face their own demons, and fight off those who are jealous of their success. Their lives as CEOs of major companies come at a high price. And just how high a price are they willing to pay? Who are they willing to sacrifice to stay on top? Those they love, or themselves? Danielle Steel’s gripping, emotionally layered novel explores the seductive and damaging nature of power. Success and greed, trust and deception, love and loss—all come to a head in this compelling drama of family, careers, infidelity, and the sacrifices some people make to hold on to power . . . or to let it go. I enjoyed the book but the narrative was so bad it ruined the book for me.